I’m working on Voile de Violette and had promised testers to two people. I’m looking through my notes for your addresses. If you see this, send me some email. 🙂 I have a version that’s similar to the original but with the change I was hoping to make. Should be ready to send out a few testers soon and know some people have been waiting for this one. Also have a really nice new surprise scent. I think I’ll add it to the list on Monday. Hope everyone who heads off to the sniffa fest this weekend has a wonderful time! Jour Ensoleille is on the site now. It’s a woodsy floral with tuberose, orange blossom and jasmine on a base of oakmoss, sandalwood, vetiver, labdanum, and green leaves. It has a bit of a chypre or vintage feel to me (minus the bergamot and coumarin), and makes me think of late summer or fall. We also have a surprise new fragrance coming soon (hoping by week’s end) that I’ve not mentioned yet. More to come soon. Just for fun, here’s a pic taken last spring of moss and lichen growing on a white oak that wraps around the deck behind the SSS studio. It’s a lovely old tree with a moss-covered trunk. It lost a branch and is putting out new growth near the place the branch was cut. 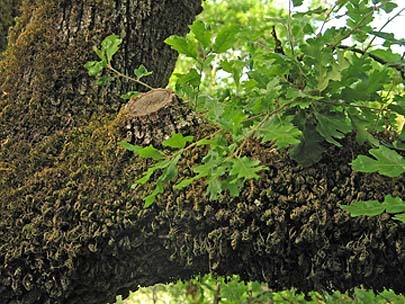 I don’t tincture moss (better to buy pure absolute), but we sure have a lot of moss and lichen on all the oak trees here. The shopping cart is up and quite a few new scents are on the Fragrance page. More scents are on the way. We have new jars for the shea cream and will post a photo soon.